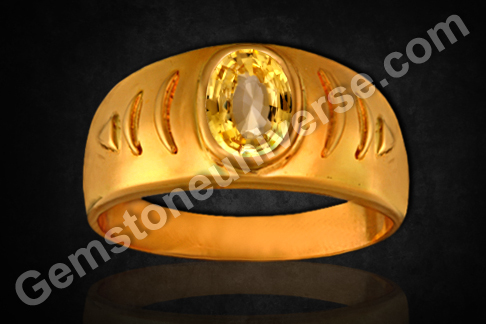 Comments Yellow Sapphire is Gemstone of the VISHUDDA chakra or the throat chakra. 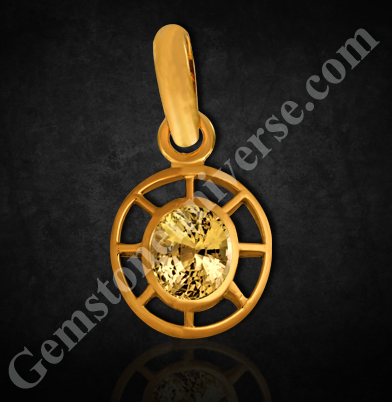 Fine unheated Ceylon Yellow Sapphire of 2.92 carats set in Dharma Wheel Pendant design. This gift from nature is equally potent for Chakra Therapy and Chakra Healing as it is for Vedic Astrology Gemstone Therapy.Jupiter is the most auspicious planet and represents truth, healing and divine knowledge. Yellow Sapphire is the Gem of Jupiter. Just as pure like its planetary lord the pleasing light butter yellow color of this unheated Yellow Sapphire came alive once set in the Gold Dharma Wheel Pendant. Nearing 3 carats with a fantastic scintillating cut it is a fine example of a Jyotish Gemstone and will bless its wearer with all auspicious things that Jupiter represents. Emeralds-The Gem of Mercury- The God of Trade and Commerce. 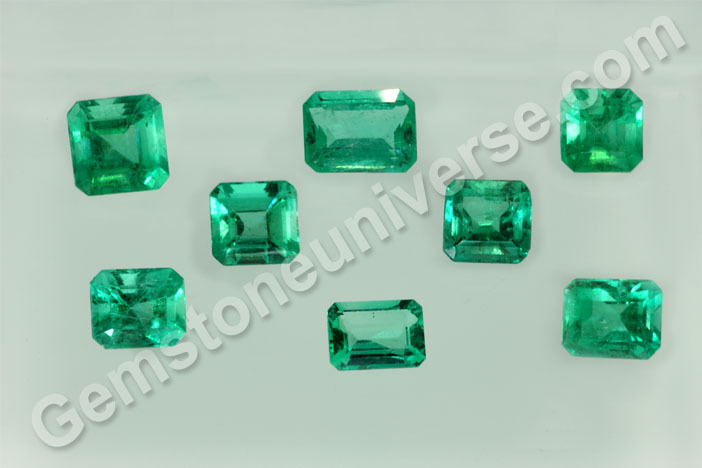 New Lot Emerald Isle 2011 for Gemstoneuniverse Patrons! Believe what you see. A portion of the new Gemstoneuniverse emerald Lot aptly named as the Emerald Isle. Fine natural Colombian Emeralds with over 95% clarity levels, a clarity level that is very difficult to find due to the presence of Jardine’s. Full of lustre, scintillation, uniformly distributed color and cut for maximum movement of light these Emeralds are tools for Destiny Recalibration. True Jyotish Gems! A Gem is for a Gem. – The Emerald should be treatment free. No epoxy, No fillers, No Resin, No Green Color Dye. Just Emerald! – The Clarity should be high enough to deliver Jyotish Quality Results. You can read emerald clarity for Jyotish purposes for more information. – Fully Natural, Treatment free Emeralds. – Clarity Levels stand at 95% which in itself is quite a rarity in Natural Emeralds. – Pleasing lovely color spread evenly. – Symmetrical Emerald cut to further attenuate the crystal nature and fine color. – Sizes are just wow. – True Jyotish quality emeralds from Colombia. Certification and Appraisal of this Lot is complete and you should have them in the Emerald inventory shortly. Brilliance of Lustre, splendour of color, purity of nature and Vedic Power of Saturn and Jupiter in the new mix Sapphire lot- Prajapati. November 2011 special! Notice good color, lack of treatment, rustle and clarity levels above 95%. True Jyotish Quality Sapphires. Get delighted dear Gemstoneuniverse patrons. 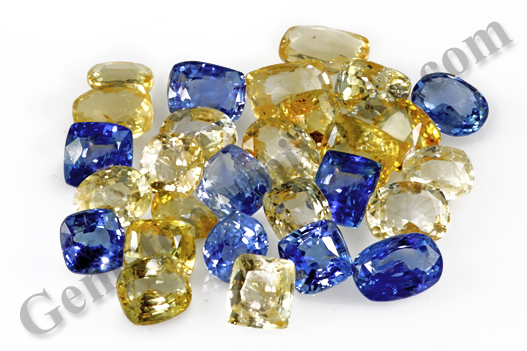 On display here is the new lot of mix sapphires-Yellow and Blue to capture your imagination and deliver the best of results of Vedic Gem therapy. These Vedic beauties come from our own roughs and have been fashioned into ovals and cushions under our own watchful eyes. – Pleasing even color. Nice even spread of Yellow and Blue. – Very Nice lustre that indicates that the Gems are of good water. The Clarity level is so so good that they possess an internal fire and brilliance. – Fully Natural- No heat or enhancement that ensures that they are true Vedic Gems. Each of them waiting to create a miracle. – Coming from the famed Gem Fields of Ceylon. – The Unique combination of excellence of cut, color, clarity and carat weight make each one of them magical! They are dynamic, loving, and full of life. View them at any angle and they look differently beautiful, powerful and enchanting. Evert single Gem is a Blessing. – Lot Name Prajapati in honor of the creator of the Universes Lord Brahma who wrote the destiny of each being. Certification and Appraisal of this lot is complete and you shall see them listed in the Blue and Yellow Sapphire inventory in the next 3 weeks. Natural Pearl ring for Moon Energies as per Indian Vedic Astrology- Flawless Blemish Free pristine White Natural Pearl! Comments Natural Pearl is the Gemstone of the Moon as Per Vedic Jyotish. To be effective to harness moon energies your pearl gemstone ring or pearl jewellery should be fully natural, non nucleated and undrilled. Always insist on a Radiography report that proves that pearl to be Natural. Any pearl sold without a Radiography report is likely to be a fake pearl or a cultured pearl and will give zero results for Jyotish Purposes. Vedic Gem Therapy only works with natural treatment free Gemstones. 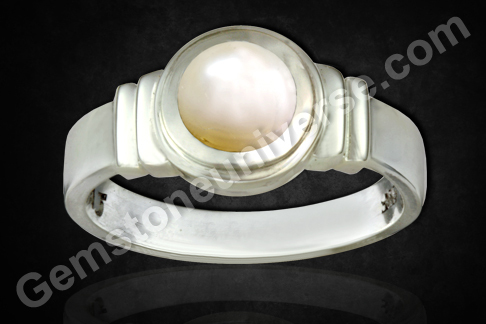 Featured above is a fine natural Pearl Gemstone Ring. The Pearl is 2.57 carats Australian Pearl. White Sapphire often referred to as the colorless Sapphire is the Gemstone of Venus and it used as a Diamond Alternative. Also referred to as Safed Pukhraj it gives very good results as a Venus Gemstone as per Gemstone Astrology. Venus is the planet of Luxury and Beauty and represents Style, Panache and class. The same attributes should be there in its Gemstone- The White Sapphire. The ideal White Sapphire should be untainted white but if it is unheated a very slight tint of blue and cream is acceptable. 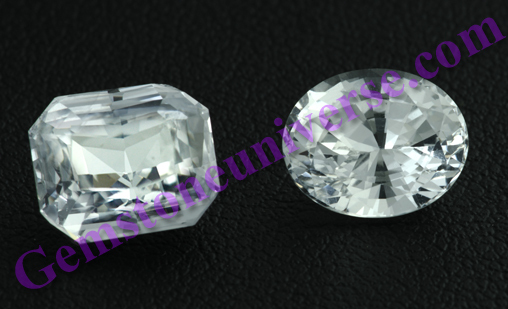 Jyotish Quality White Sapphire is very rare. For a gem to be Jyotish Quality it has to be beautiful, lustrous, full of that special spark that empowers it to work like a Vedic Gem besides being fully natural and unheated. Featured here are two white sapphires that make it to the Jyotish Quality Grade. Today White Sapphires are much more rare than Blue Sapphires and Yellow Sapphires. The strict quality process at Gemstoneuniverse and dedication to Planetary Gem Therapy ensures only the top grade gemstones being listed. These will shortly be listed in the White Sapphire inventory. 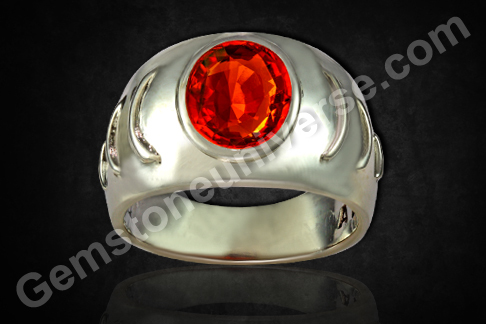 Which is the best Gemstone for Rahu Mahadasha and Rahu periods- Hessonite the Gem of Rahu set in Planetary Ring. Comments Hessonite is the Gemstone for Rahu as per Indian Vedic Astrology. Hessonite Garnet Rings are quite popular as Birthstone Jewelry.Hessonite also known as Cinnamonstone is particularly effective during the Rahu Mahadasha and Rahu Antardasha periods as per Indian Astrology. Featured Above is a fine and lustrous 4.21 carats untreated and earth mined Hessonite from Ceylon. At Gemstoneuniverse we never believe a Gemstone to be classified as a Semi precious stone. If it is a rare mineral sample, beautiful, lustrous and treatment free it is fit to be called as a Gemstone- The adjective gem is used to describe something superlative. Among the Gemstones, Garnet is considered to be January birthstone. Garnet Jewelry is quite popular all across the Globe because of its instant eye catching color. According to Vedic Astrology Red Garnet is the alternative healing gem for Sun and should be used instead one cannot go in for an Unheated Ruby. 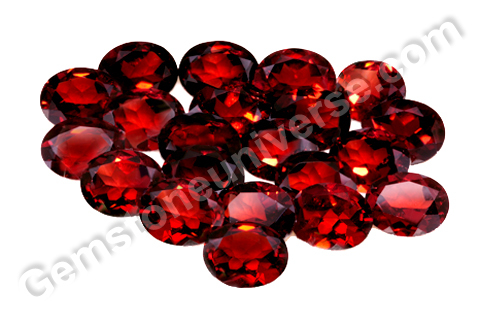 Presenting new Lot of Red Garnets from Mozambique for superior Sun powers. Alluring color, near eye clean nature, treatment free natural gemstones for best of Vedic Energies! – Calibrated Premium Jewelry Grade Red Garnets. 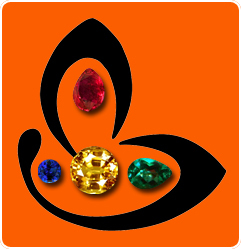 – Fully treatment free natural gemstones. – Inherent fire and lustre. – Sure to give positive results in Planetary Gem Therapy for Sun. Certification and appraisal of this lot is complete and you should have them in the Red Garnet inventory in the next 3 weeks. 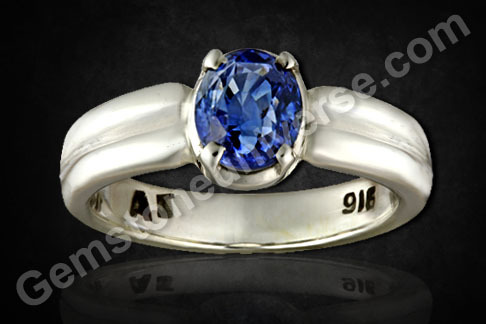 Comments This Blue Sapphire is a fine example of what exactly a true gemstone should be. When we normally talk about features we would like to you see that it is 2+ carat Blue Sapphire, Its beautiful because of its nice color and inherent lustre fully natural and free from treatment as a Jyotish Gem should be and totally free from any flaws listed in the sacred texts. When all factors combine together you get a Jyotish Gemstone. Listed first in the Blue Sapphire inventory on 20th October 2010, it was priced fantastically at $300 per carat since we owned the rough from which this beauty was fashioned. Despite the great price point and all the features and benefits it finally reached its rightful owner in November 2011. Despite thousands of visitors viewing it daily, it chose the one it wanted after such a long time. Our expertise in Gem therapy and gemology translates into huge benefits for our patrons. Today we cannot source this Gem material at this price. The same quality level trades at 35-45% increase in a B2B price. This is a B2B price for those who make heavy investments for huge lots or roughs and are skilled negotiators. This is the Gemstoneuniverse value advantage. 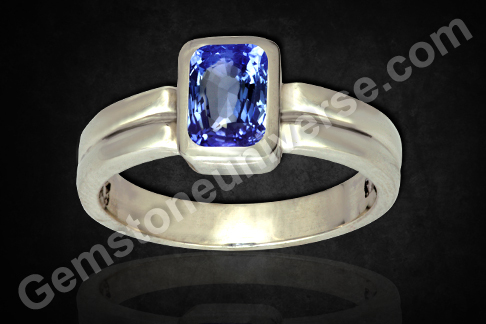 To buy this singular gemstone today at even double its price would require huge amounts of good luck. But as always, once a Gem Price is listed at Gemstoneuniverse it never gets changed. This lucky patron has had a return on investment the very first day. This is what should happen with true Gemstone. It does not happen with stones. It happens only with Gemstones. Some Visitors after viewing the Blog would ask when this quality would be available at this price point. The answer is unlikely but not impossible. We cannot change the laws of demand and supply. We can only say- Don’t delay your therapy.